Geoffrey Rose Design provides custom web design and web development services to Spokane, WA and the surrounding area. All websites that I design and develop will be professional, and will look great on whichever devices they are viewed on with mobile-friendly web design. The design of a website is very important. Having a well-designed website improves the users experience and can keep your customers coming back. When a website provides a positive user experience, customers are more likely to purchase your products or services and recommend them to their friends and family. Even if you have the most amazing products and services around, a sub-par website experience could send a potential or long standing customer elsewhere. All websites will be built with a custom web design that will be created around your specific needs and goals. I do not use “pre-built” design or themes and then adjust it ever so slightly to make it look “custom.” This ensures that no other website or even worse, a competitor’s website would have the same design as yours. This is important from a branding standpoint as well. You want your website to be immediately recognizable by your customers or potential customers. This will reassure them this is the business they are looking for. Mobile-friendly web design (you may also hear this referred to as responsive web design, they are the same thing) ensures that a website will look great no matter what device they are viewed on. Anything from your smart phone, your tablet or your laptop, your website will look great. It will appear to be tailored made for you and your device, but when in fact, it is the same website. No more need for those mobile only website, that look nothing like your main website. Mobile-friendly web design is vital for all websites, because the number of people who browse the web on their phones, tablets and other mobile devices is rising (and it’s a lot). Nearly 50% of all web traffic today now comes from mobile devices. It’s important that the integrity of your site is not lost because of poor design and inability to adapt to various devices. If your website is not mobile-friendly, it is quite possible you are missing out on many potential customers. If you do not currently have a website and want one, your current website doesn’t meet your needs or maybe you want to redesign your current website. I will work with you to help create a website that will best represent your specific needs and goals. If you are ready to get started on your project, that’s great, kick it off right by receiving a Free Quote, with no obligations. However, if you are not ready to start on your new website quite yet, no worries, you want your website to be great and you shouldn’t rush into it if you are not ready. If there are any questions you have or if you are unsure of anything send me a message and hopefully I can answer any questions or concerns you may have. The design of a website is important. Having a well-designed website improves the users experience and can keep your customers coming back. When a website provides a positive user experience, people are more likely to buy your products and/or services and recommend them to their friends and family. Even if you have the most amazing products and services around, a poor website experience could send a potential or long standing customer elsewhere. You might of heard of "Mobile-Friendly" web design, but unsure what this is. Having a mobile-friendly website allows your website to look great on every device. Anything from your smart phone, your tablet or your laptop, your website will look great. It will appear to be tailored made for you, but when in fact, it is the same website. No more need for those mobile only website, that look nothing like your website. Websites need to be redesigned, refreshed, every so often, it is the nature of the beast. New technology is released, your business model changes, you offer new services or want to offer new services but your website is no longer up to the task. Or maybe your website looks old and outdated. It may be time to update your website with a fresh clean look to be more appealing to your current customers and better represent your needs. Unreal Navigation is a website which helps you get started with creating navigation for your website. 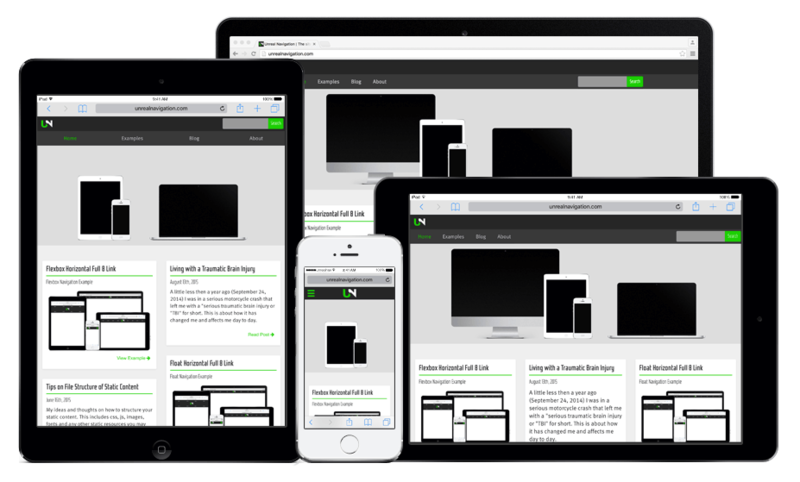 All of the navigation examples are fully responsive and built with a mobile-first approach. Each Web navigation example provides you with the necessary code to get started. There are demos of each, too, so the visitors can see each in action. Unreal Navigation also has a blog and an admin panel to allow for easy editing.